A cat spent five days trapped in a sofa donated to a charity shop before being found by the couple who bought it. The three-seater settee was given to St Luke's Hospice charity shop in Grays, Essex, by Pauline and Bill Lowe, both 66, from Corringham. Ten-year-old Crockett was discovered when the new owners heard "a soft miaow" coming from the furniture. 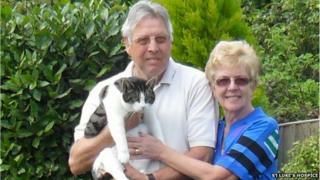 Mrs Lowe said she had been "devastated" to lose Crockett and the family were "delighted" to have him back. Charity shop staff took two sofas from the Lowes' house in York Avenue on 24 March, but one had to be taken apart to get it through the door. The Lowes believe the grey tabby sneaked inside the sofa outside their house before the base was replaced. Mrs Lowe said they immediately noticed he was missing but could not think where he might have gone. David Emery, from St Luke's, said the sofa went through "normal routine checks" and had been taken to the shop where it was sold and delivered to new owners on 27 March. Crockett was discovered a day later by the sofa's new owners. Shop manager Jenny Munro said: "[They] heard a soft miaow sound and, on further investigation of the sofa, saw two claws poking out of the material which moved away when touched. "In order to release the cat they had to rip the material under the sofa as Crockett had lodged himself well into the back." The sofa's new owners, who wish to remain anonymous, said: ''We are so thrilled that he is safe and sound and was found in time."